The ATtiny85 isn't your everyday Arduino IC. It packs a lot of punch for its small size, but there are some things it can't do. 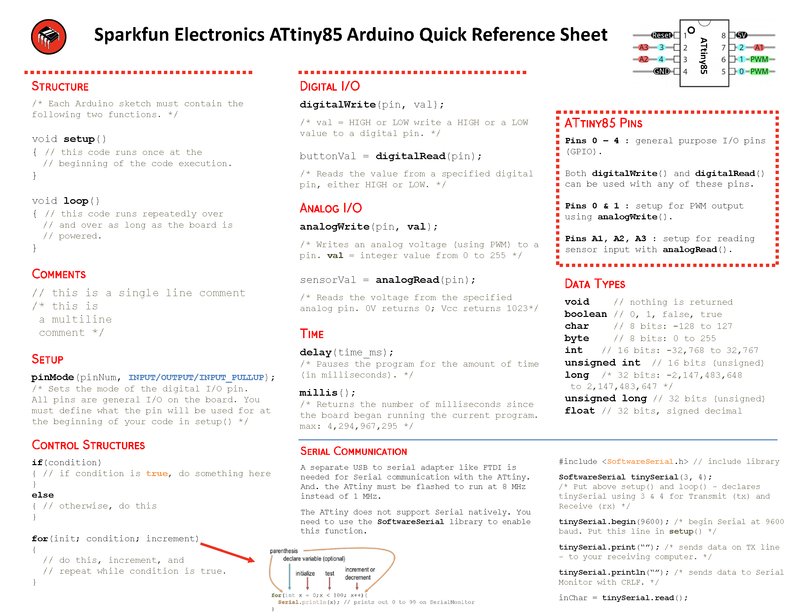 On this page, we'll provide a quick overview of the ATtiny85 as it pertains to Arduino and the Tiny AVR Programmer. Just like any Arduino board, each I/O pin on the ATtiny85 is assigned a numerical identifier. These pins are documented on the board as well, but you can also refer to the image below if you forget. Each of the I/O pins on the ATtiny85 are capable of digital input and output. Beyond that, some pins have special functionality. Note: For advanced users, you can modify the ATtiny85's timer/counter registers to increase the number of PWM channels available! You can get up to four PWM channels by following this tutorial here: Technoblogy - Four PWM Outputs from the ATtiny85. The example just runs PWM on the ATtiny85. If you are trying to add more features outside of the PWM example, there might be some unexpected behaviors since it is modifying the timing registers. After resetting the chip, you can proceed to upload code to the chip through the Arduino IDE as explained earlier. No Serial (UART). Yes SPI and I2C. You may notice, on the listing of special pin functions there are no UART RX's or TX's. That's because the ATtiny85 doesn't have a built in hardware UART. If you try to compile any Arduino code with Serial.begin(9600)'s or Serial.print()'s you'll get an error. So you're out one of the more useful Arduino debugging tools. You can't print to the Serial Monitor. But the ATtiny85 does still have I2C and SPI, which are much more commonly used for sensor communication these days. Unfortunately, the Arduino libraries for these interfaces haven't yet been written for the ATtiny85, but there are some user contributed libraries around the web. USIi2c is an Arduino library which enables I2C on the ATtiny85. There are other ATtiny85-focused libraries out there too. Like a Servo8Bit, a servo library. There's only so much excitement you can get out of dimming a single, yellow LED. You'll eventually want to branch out, and start connecting your tiny85 to other electronic components. There are a few ways to do this. The easiest, least permanent prototyping route is to use the prototyping headers on either side of the socket. You can connect standard, male jumper wires to these pins, which can in turn be routed to breadboards or other components. For more permanent projects, it's easy enough to gently remove the IC from the socket, and plug it into a PCB or breadboard. Eventually, once you've iterated enough on your sketch, this is probably where you'll want to go. Eventually you arrive at finished designs like the H2OhNo! or the LectroCandle. Trying to reprogram an ATtiny85 with a SOIC Package? There are a few ways to connect. The easiest would be to use the IC test clip and M/F jumper wires.